The Standard Perth is something that we had heard was brewing and when Renee from Great About Perth posted a spectacular photo of it on Instagram it became top priority to go in and check out Northbridge’s new bar, garden and kitchen. One night before Xmas I had done 6k’s in the pool leading into prep for the Rottnest Channel Swim and had a decent appetitie. One thing that frustrates me with Perth is arriving at a restaurant and being told at 8:30pm “the kitchen is closing”. Anyone relate to this? Leave a comment below! The Standard Bar Perth had posted some photos showcasing their outdoor area back in December which we shared on Facebook to a healthy response. Having always been a sucker for outdoor living and drinking overlooking the city landscape at night in our beautiful city of Perth, we ventured down for a late dinner in Northbridge. We arrived at 28 Roe St Northbridge (just near Chinatown and adjacent to Pleased to Meet You) around 9:30pm on a Thursday night. We were advised the kitchen is open until midnight, 7 Days! Fantastic. We sat upstairs after being greeted downstairs by the bar staff and I asked if it was cool to take photos with my Mogopod and Canon 6D – all good. Impressed with being told it is completely table service we chilled out upstairs and looked over the drinks list which was wrapped in a shiny silver dazzling cover. This cost $25 at Standard Bar Perth! 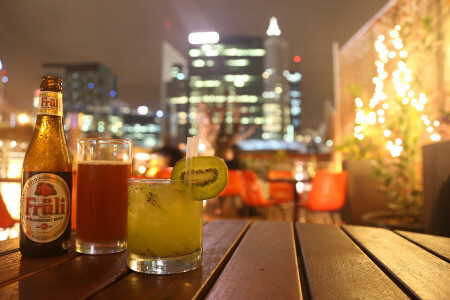 The beer is a Belgian White Beer ($9) brewed with pure strawberry juice & the Cocktail ($16) is called Lorde of the Kiwis. It has Tequila, Lavender, Vanilla, Kiwi & Apple. Add YOUR photos of The Standard Bar Perth to our online community by hash tagging #thefoodiehub on Instagram or Twitter and posting them to The FoodieHub’s Facebook page. Or write YOUR own review! 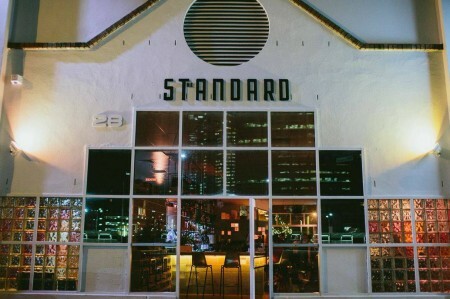 Leave a comment below and tell us what you thought of your experience at Standard Bar Perth.